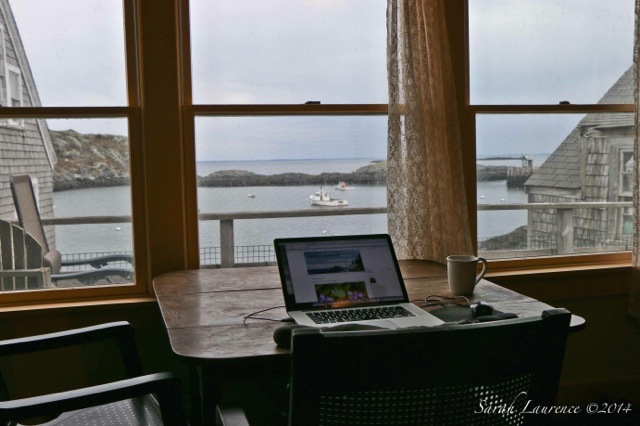 Earlier this month, I spent a week on Monhegan Island researching my novel. 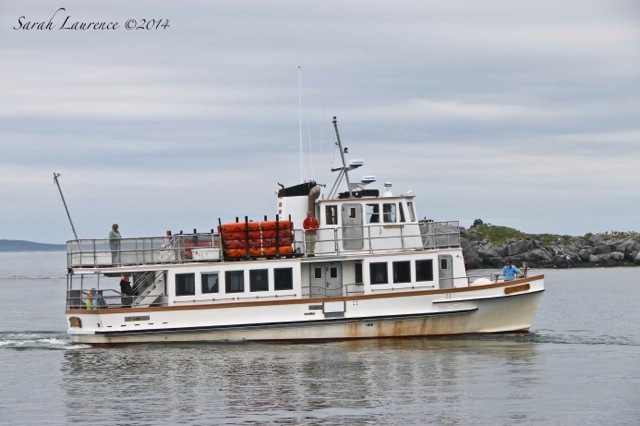 Off season the mail boat goes only a few times a week from Port Clyde. It was a rough one hour ride in eight-foot seas and pouring rain. Even one of the crew got sick, but my husband was in his element. Henry's father, a former merchant navy captain, once told him that the best cure for seasickness is to sit under a tree. Henry (in orange topside) had come for the weekend to help me settle into my solitary retreat. The only other visitors to the island were migrating birds (loads of warblers!) and intrepid birders. Their accommodations were unheated and unpowered. The tourist season starts Memorial Day Weekend and runs through September. The rest of the year is lobster season. 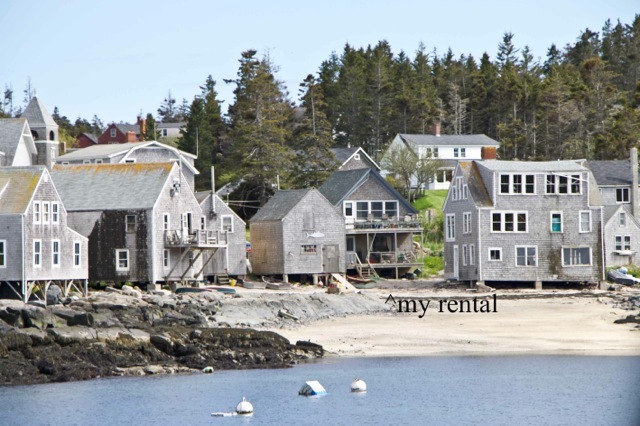 I rented an attic apartment in a former boat house, which had propane, electricity and even wifi. My landlady, who lives below, runs the only grocery store and is the sternwoman on a lobster boat. Most of the 40 or so year-round residents work two jobs. Lisa answered many of my questions about island life. Other answers came from watching the harbor out my window. I'd wondered how trucks got to the island since only passenger ferries service the island, docking at the wharf. 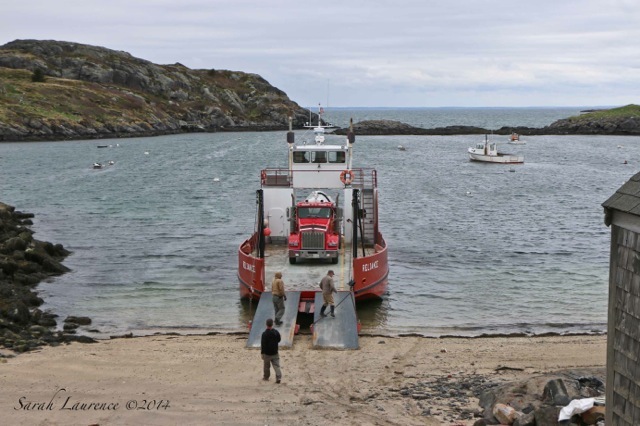 This truck ferry unloads onto Fish Beach. It idles until the truck is ready to leave. Good thing I packed ear plugs! 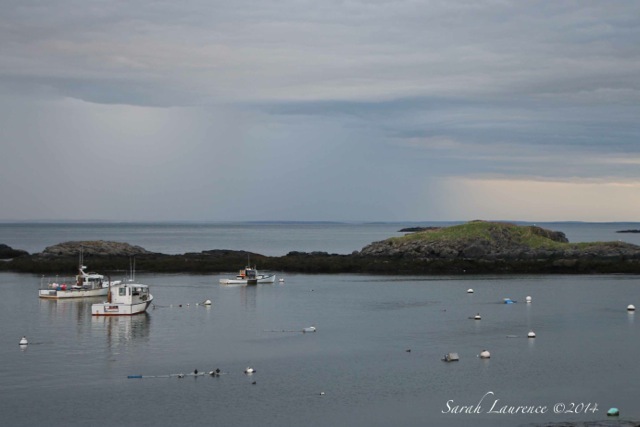 I watched the lobstermen without leaving my desk. One of my characters works the stern in his dad's lobster boat. 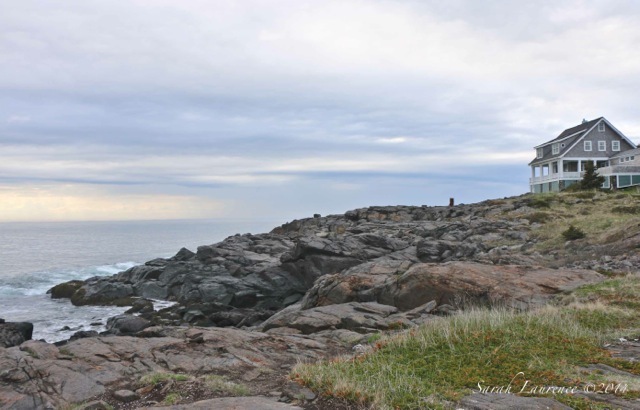 He lives on an island that resembles Monhegan but with a larger population. I needed more teen characters in a young adult novel! 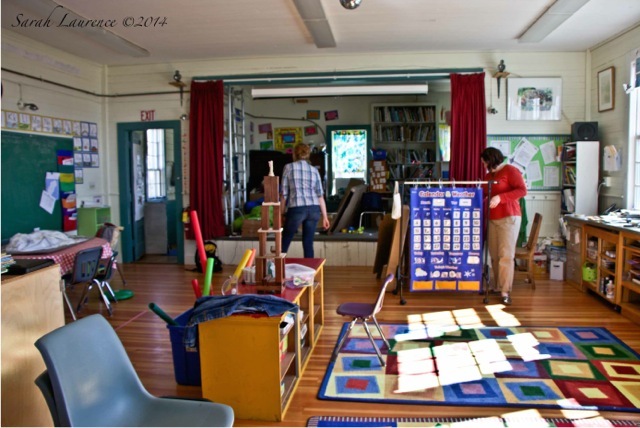 I'd wondered about the one-room school house on other visits to the island. This time I wanted to peek inside, but I'd had no luck tracking down the teacher online. 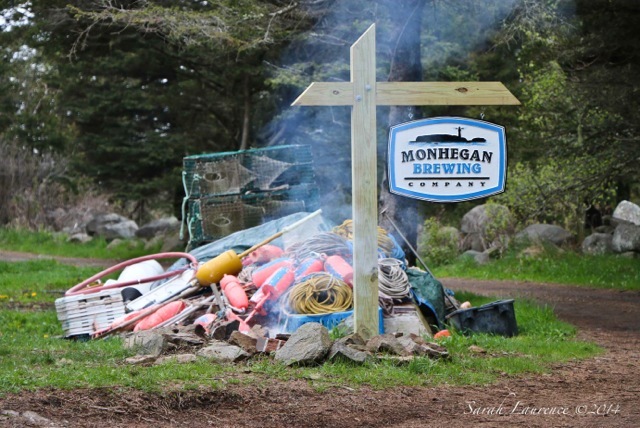 Feeling discouraged, I decided to check out the new Monhegan Brewing Company. The delicious beer was served in seven ounce tasters as well as in pints. It was full bodied and smooth. My favorite was the Trap Stacker Special Ale with a hint of molasses. By happy coincidence, I ran into an author friend Paul Doiron and met his wife Kristen Lindquist, an avid birder and talented poet-blogger. The whole state of Maine sometimes feels like a small town. The proprietors shared their romantic story. 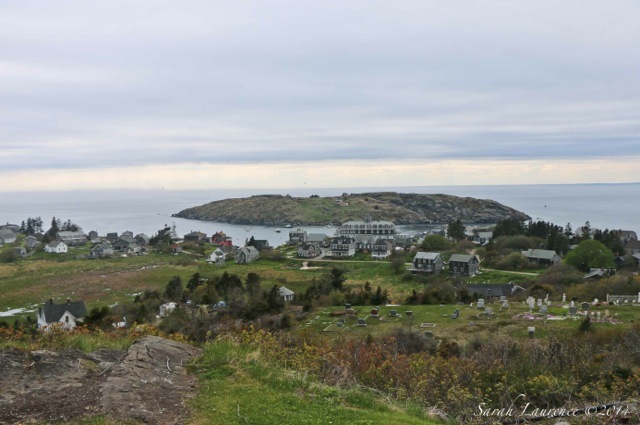 Mary had moved to Monhegan after falling in love with Matt Weber, an island lobsterman. 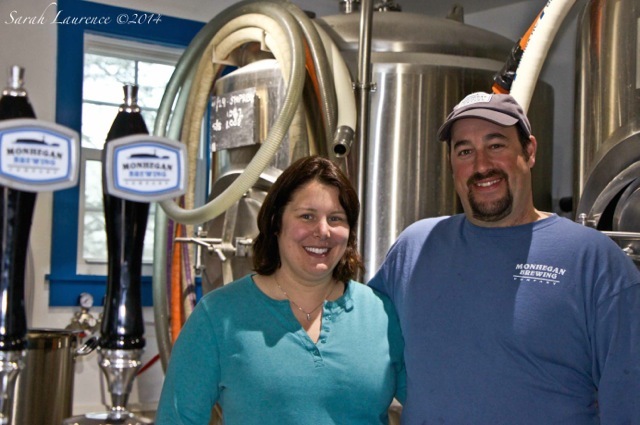 They'd opened the brewery last summer, offering tastings on weekends. 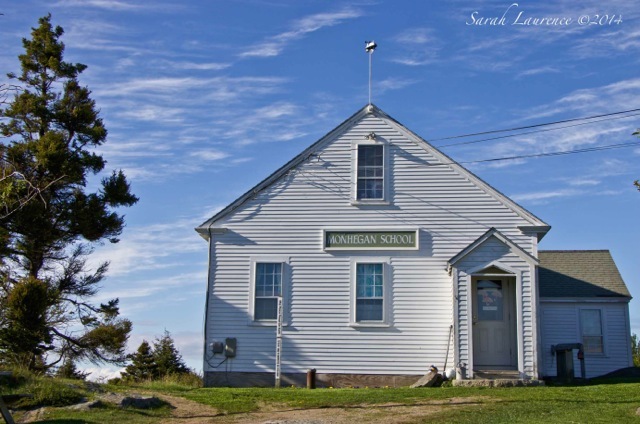 On weekdays Mary teaches at the one-room school house while her husband is hauling lobsters. I'd found my elusive school teacher! It's Mary's last year teaching since she needs more time for the brewery. Matt answered my questions about island lobstering. Mary invited me inside the one-room school house. It was bright, sunny and surprisingly up to date. All students have laptop computers supplied by the state. The video screen allowed the kids to collaborate with students at other island schools and for teachers to conference with one another. There's a stage with a piano and the kids' performances draw in all the islanders. 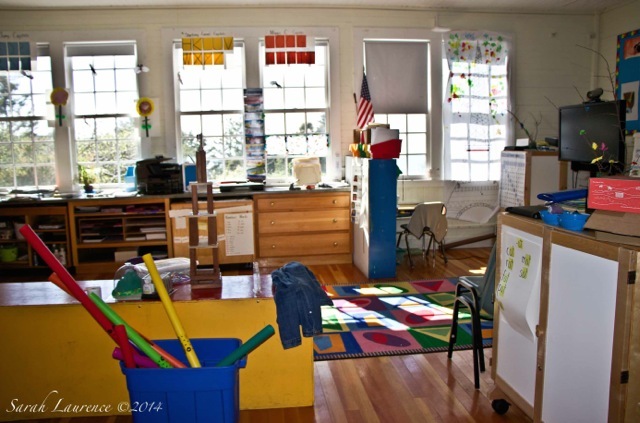 The school currently has two half day preschoolers and one full day third grader. In past years, there were more kids, and the island would love to have more families. 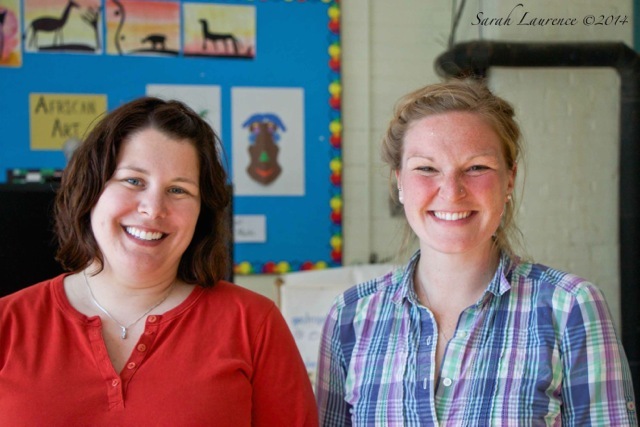 Mary introduced me to Jessie Campbell, who used to teach at Monhegan and is now the coordinator for the Outer Islands Teaching and Learning Collaborative. Jessie shared her insights about island schools. 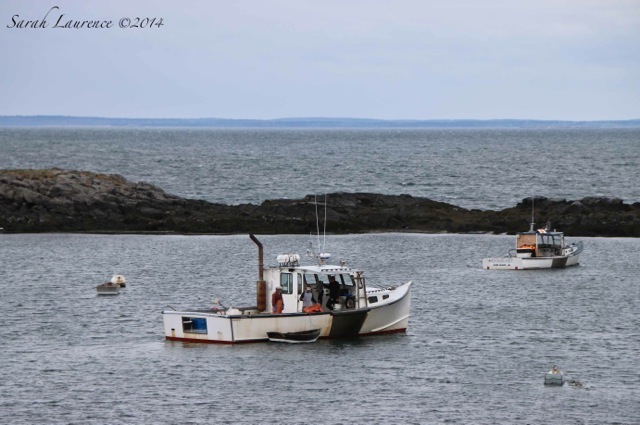 Frenchboro and Isle au Haut have generations of lobstermen families, more like my imaginary island community. The lucky island kids gather to go on fieldtrips to the state capital, to the mountains, to Boston and even to Quebec. Educators visit the islands too. The kids go off-island for high school, like my narrative. 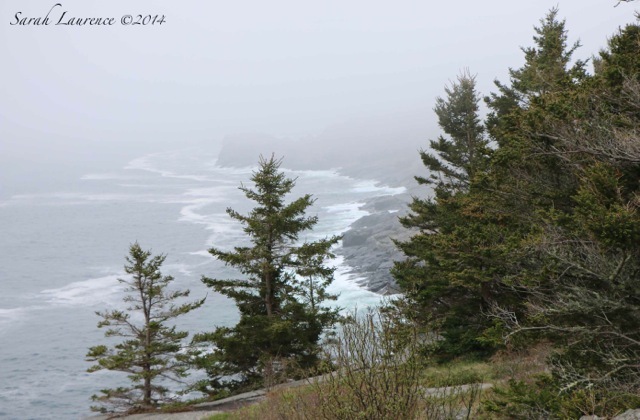 At Lobster Cove I photographed the house that was the inspiration for my character's home, although his is more modest. It's my dream house too. Can you see why this island inspires me? Back "home," I watched storm clouds ripple the sea. The weather wasn't the best for painting watercolors, but I took many photos. I'll share the artsy ones in another post. I miss the island already. 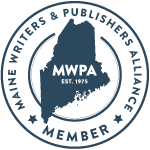 This was a long winter, even by Maine standards. Spring comes late this far north. Late March through April is Mud Season. In May the grass turns green overnight and everything starts blooming all at once. We hit 79F degrees on Sunday, which was the best Mother's Day gift. A walk at Popham Beach was in order (saving those photos for another week.) 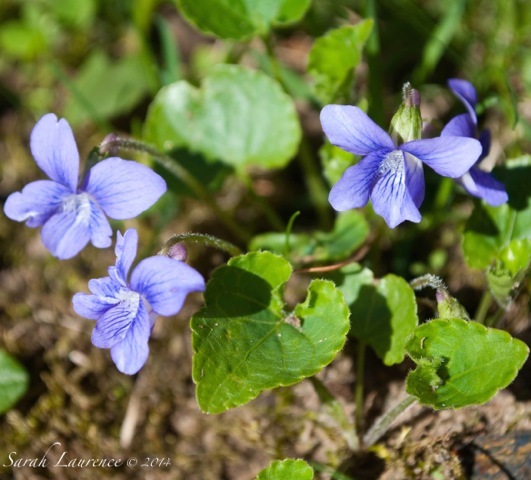 It was so nice to be welcomed home to wild violets in the garden and cut roses from my family. The azaleas are budding too. 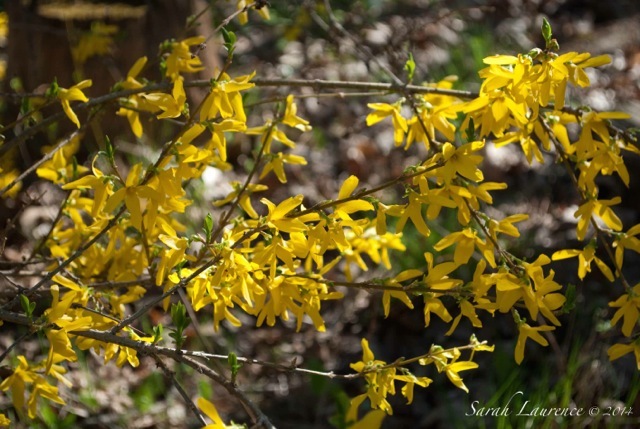 The first to bloom in our White Pine shaded yard is always the forsythia, but usually that happens in late April, not May. There were fewer buds and the rhodies are half dead due to the unusually harsh and snowy winter, I believe. Any advice on how to resuscitate browning rhodies? 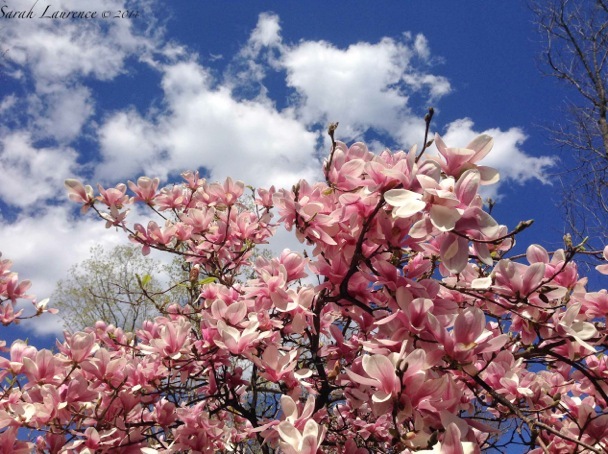 The magnolias in Bowdoin College's quad are at peak bloom. Can those be new leaves on the trees? Soon the wildflowers in our woods will burst into bloom. Only Scout is missing the snow. Happy Spring! 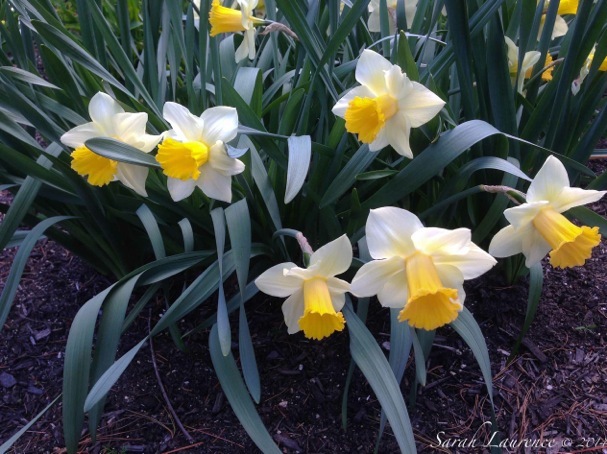 Follow this link for more Garden Bloggers' Bloom Day posts. 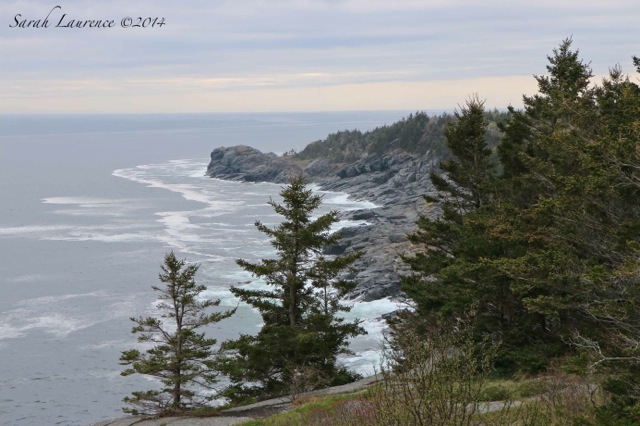 Next week I'll be on Monhegan Island for a solitary writing and art retreat, researching my WIP. Next post Wednesday May 28th. Vacation Question: after several years off, the car ferry is running again from Portland, Maine to Yarmouth, Nova Scotia. My husband and I are planning a week long anniversary trip this summer, bringing the car. Any tips on where to stay and what to see? Have you ever seen yourself in a character? What if it wasn't your imagination. 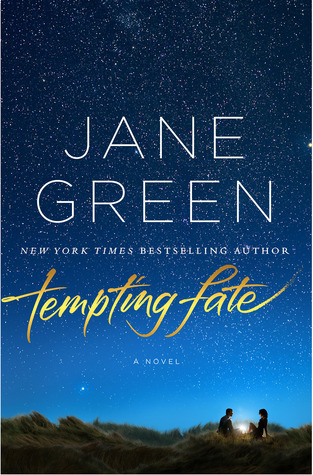 Jane Green confessed that the protagonist of Tempting Fate was modeled after me. A few years ago, Jane and I connected through her books and my art. We met for lunch at her house and had a wonderful time. Jane is as charming and warm as her novels, and she's a superb cook. I wish we lived closer. Jane and I share a lot in common. She's a Brit married to an American, and I'm an American married to a Brit. I once lived in Swiss Cottage, London, where she went to school. Her current home is in Westport, Connecticut, where my father grew up. Jane studied art and is one of my art clients. 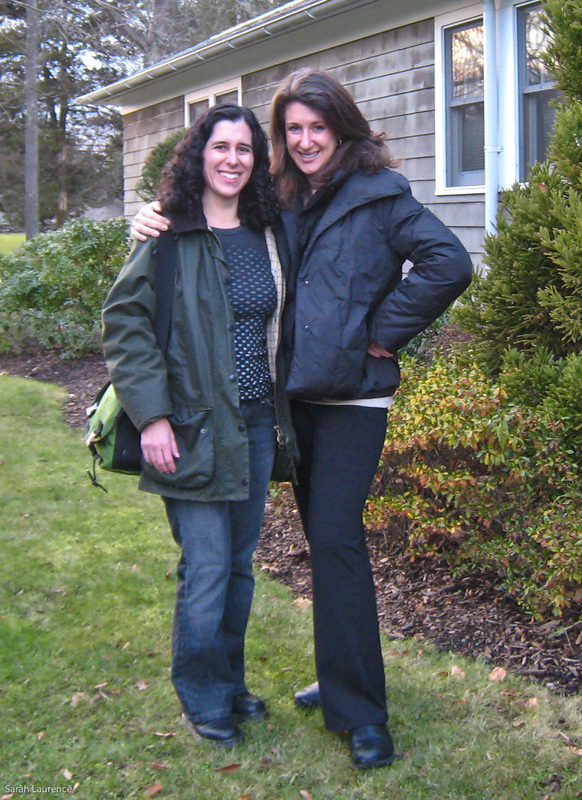 We shared the same first literary agent (before we met.) Now we have yet another connection. "She settles on black pants, all the better to hide her thighs with, and knee-high boots, the only pair in her wardrobe that have something of a heel. These boots are almost ten years old, old enough for them to have gone completely out of fashion, then revolve full circle to be not dissimilar to all the boots she passed in the store windows in town." The character has my hair and prefers the natural look as I do. However, her personality isn't mine. Jane assured me, "Gabby is nothing like you - but in my head she looks exactly like you!" 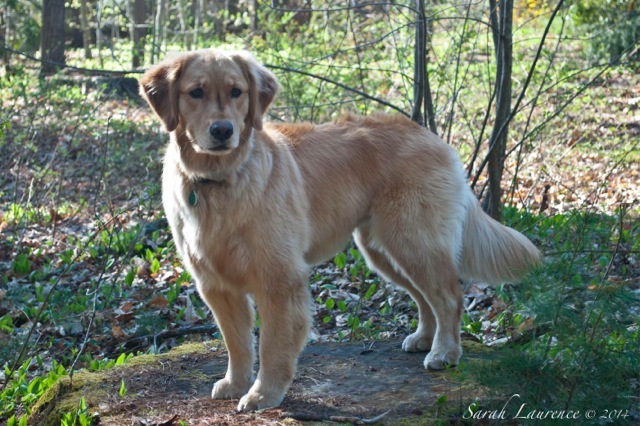 My synopsis: Gabby is an ex-pat Brit, who lives in posh Westport, Connecticut. By age 43, Gabby has everything she ever wanted: a happy marriage, lovely children, good friends, a nice house and a budding career as an antique restorer. Down to earth and sincere, Gabby is the least likely woman to have an affair. On a rare girls' night out, an attractive younger man hits on her. Matt is the founder of a hot new social media site. He represents everything what has faded from her life: passion, risk, potential and youth. Gabby never meant their innocent flirtation to grow into anything more, but it revitalizes her. One bad choice leads to another. Are you laughing with me? My husband took the news of my doppelganger's shenanigans with good humor. He's had practice since I write fiction too. I don't model my characters on real people, but scenes from our life end up on the written page, albeit transformed. "They volunteered to be room mothers, joined the PTA, accompanied the children on every field trip, showed up on the classroom having spontaneously baked twenty-four nut-free, lactose-free, gluten-free cupcakes." I've reviewed several of Jane's books, but this one is too close to home for me to be objective. Of course I identified with Gabby and found her choices disturbing. I liked how the narrative focused on the consequences of adultery without passing judgment. The resolution was satisfying. I'd recommend Tempting Fate to readers who enjoy women's fiction and to curious blog followers (but not my parents!) Kirkus Reviews called Tempting Fate "A Scarlet Letter for the twenty-first century." Released in March, the novel was #8 on the NYT Best Seller List. I'm flattered and quite amused to be the physical inspiration for Gabby. My life is feeling quite surreal. Reviewer's Disclosure: the author asked my permission before revealing my connection to Gabby. Her publisher, St. Martin's Press, sent me a review copy upon my request. I was not otherwise compensated.